Our on-line listings can be browsed and searched for by title, author, keyword or catalogue by clicking on the "Search & Buy our Books" link on the right. Only a small proportion (approximately 5,000 of 15,000 plus) of our books are listed on-line, so a visit to the actual, real, bricks and mortar shop is always recommended. Being in Stratford upon Avon, we always try to have a range of Shakespeare's works, Shakespeareana and Shakespearean criticism. 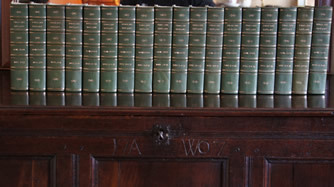 We also have a wide selection English language and translations of classic literature (Austen, the Brontës, Dickens, Hardy, Henty, Henry James, Kipling, Scott, Bernard Shaw, Robert Louis Stevenson, Spenser, Thackeray, Trollope, and on to Zola. Twentieth and twenty first century literature is equally well represented, from Douglas Adams through to Virginia Woolf - in short, all the great authors. Copyright © 2019 Chaucer Head Bookshop, Stratford upon Avon. All Rights Reserved.